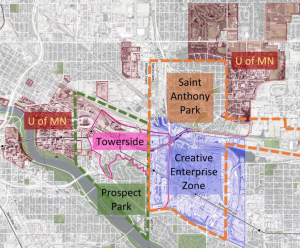 United’s campus is located in the St. Anthony neighborhood of St. Paul, Minnesota, at the intersection of the Towerside Innovation District and the Creative Enterprise Zone. It is just off the METRO Green Line, a light-rail line that runs between downtown St. Paul and downtown Minneapolis. Our space is welcoming and well-situated in its urban neighborhood. You can grab a meal before or after class at one of a dozen restaurants and cafes within a five-minute car ride from campus. Or, heat your meal in our kitchenette and join friends at one of our harvest tables. At various time during the week, you can attend a worship service or meditation session in our chapel. Our arts space, The Intersection, provides a place for lectures, practicums and other artistic experiences. Best of all, you put what you’re learning into practice by serving people just outside our doors. New to Minnesota? The Minneapolis-St. Paul metro area is consistently named one of the best places to live in the United States for its affordable cost of living, vibrant neighborhoods, extensive urban park system and robust arts scene. We invite you to visit us and discover what makes United special!